In 2013, the then-thriving internet and tech firm LeEco put out its next-generation “Super” television series, which launched the smart-TV craze among Chinese gadget manufacturers. Smart TVs provide video content from their own platforms or from partners that can stream video content. The devices are usually priced less than traditional sets to attract buyers. After LeEco, industry rivals — both traditional TV-makers such as Skyworth and gadget-makers, including Xiaomi Inc. — launched their own models. Smart TVs soon became a hit. Last year, smart TVs dominated the television-set market with an 86% share, according to Beijing-based data firm All View Cloud. However, the experiment that began with a bang seems to be going out with a whimper. The sales volume of smart TVs dropped 2.3% last year to 4.1 million units, compared with a gain of 21% the year before, All View Cloud data shows. The TV market as a whole saw sales volume drop by 6.6% in 2017, the steepest slump in 14 years. As smart TV’s reputation has taken a hit from the LeEco capital crunch since late 2016, and as the price war has driven out most industry players, a growing number of companies are turning away from the technology or thinking of alternatives. After the internet emerged in ordinary people’s lives in the 1990s, users’ attention shifted from TVs to computer screens, and then smartphones. The entire tech community is betting on which screen will be the next to attract eyeballs. Some companies have bet on televisions, which can entertain a whole family at once instead of only one person — the latter being a market niche that smartphones and personal computers have already satisfied. LeEco was among the first companies to make the bet. 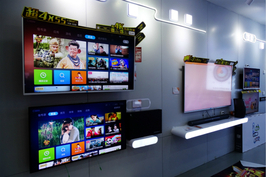 In its promotional slogan, the firm described the Super smart TV as “half the price with twice the functions.” For each set it sold in 2014, the company lost 375 yuan ($59.20), Caixin has learned. LeEco, formerly known as LeTV, started as a video content provider and streaming platform. It snapped up TV rights all over the world, including the coverage of NBA games in China and the English Premier League in Hong Kong, to create a full portfolio and attract paid subscribers. Other traditional-TV manufacturers also have created new brands to market the nascent product. Skyworth sold its smart TVs under the Coocaa brand, which secured investment from internet and entertainment giant Tencent Holdings Ltd. and iQiyi.com. Other companies, including TCL Corp., Sichuan Changhong Electric Co. Ltd. and Konka Group Co. Ltd., have all launched similar products. 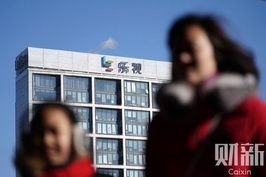 However, LeEco has suffered a cash crunch since November 2016, when founder Jia Yueting first acknowledged that the company had expanded too quickly into a number of new areas, like smartphones and new-energy cars, that were outside the company’s core online-video service. Since then, many of LeEco’s suppliers and business partners have complained of unpaid bills, forcing the company to seek new funding. Although LeEco’s trouble didn’t come from the smart-TV business, the whole industry started to struggle as the reputation of the product, one of LeEco’s labels, has soured. In 2017, most news stories related to smart TVs were negative, said Zhu Yuanyuan, a home-appliance analyst at All View Cloud. At the same time, TV-makers and retailers began realizing that the cash-burning price-reduction business model wasn’t sustainable, especially when the cost of liquid-crystal display (LCD) screens, which accounted for around 70% of a TV’s total production costs, rose for 14 consecutive months through June 2017, the longest appreciation period of all time in China; the price of some of the displays jumped by 50% in that time, according to All View Cloud. “Many smart-TV brands died in 2017, and the remaining ones are repositioning themselves,” said Yin Yu’an, vice president of video provider and smart-TV-maker PPTV. Coocaa, the smart-TV brand backed by Skyworth, Tencent and iQiyi, sensed how narrow the market was and how difficult it was to make money, and started to focus on developing software rather than selling gadgets, a source at Coocaa told Caixin. The company successfully supplied its smart TV operating system to foreign brands, including Philips and Panasonic, in 2016 and 2017 respectively. Its revenue surged 255% to 288 million yuan last year thanks to the software expansion, according to Coocaa data. “The market for TV sets was vacated (by the smart-TV makers that got out), but (I) haven’t seen many domestic TV brands grasping the opportunity. It was the foreign ones such as Sony and Sharp that have occupied a large market share,” said Liu Buchen, an independent analyst of consumer electronic products. Liu said that Sony and Sharp, now owned by Taiwan-based electric-product-maker Hon Hai Precision Industry Co. Ltd., also known as Foxconn, presents a better brand, cost performance and sense of the future. The domestic ones have started to explore a new concept that may help re-energize TV sales: artificial intelligence (AI). 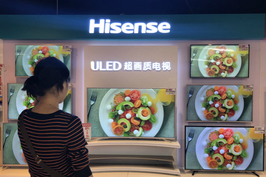 Hisense in January launched an AI TV that can understand and react to human voices. Changhong showcased an AI home appliance series two months ago at the International Consumer Electronics Show in Las Vegas. A Changhong technician there said that TVs in the future will be able to function as home security devices. But Liu said that the AI concept for now is more a marketing strategy than a real technological development, and won’t currently improve TV sales. 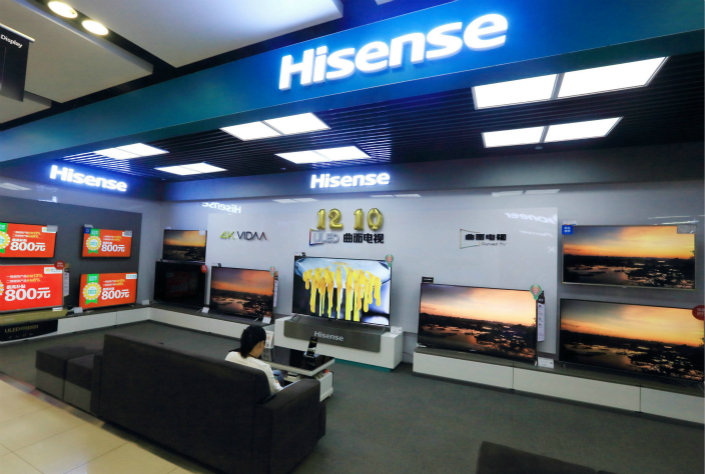 Sharp Drops Complaints Against China’s Hisense in U.S.